Eccentric wheel speeds up cable pull and allows V-brakes to be used with ordinary (non V) road drop bar levers. Bought these to convert rubbish cantis (despite expensive Swisstop pads) to mini Vs on a Kona Jake with 9 speed Tiagra brifters. Huge improvement. They do increase the cable pull just enough to operate the mini Vs with reasonable pad to rim clearance. The brakes are now 200% better. Have survived one Scottish winter and looking good so far with TLC and regular GT85. Tried to use these with ergo power levers and they did not seem to increase the cable pull at all. Use a Travel Agent as these work. Hi, can't understand, how does it work ? Looking on photo, I have been thinking, that during pull by lever simoultanously two things happen : gap betwen parts of holder is increasing AND pulley is rotatin. But have realized, that acctually on the photo I'm looking on two dirrerent parts (top and bottom adapter is different). Is it decidated specificly for front and rear brake ? And could you explain how it works ? The base is fixed on both and they are identical so it does not matter which you run on the front or rear. The cable runs through to narrower part of the pulley when stationary, once the brake is pulled the cable pull the pulley round to the larger section effectively increasing the amount of cable that is pulled at the brake end without requiring more cable to be pulled by the lever. How Many V-Daptors Are In Each Item? These are sold as a pair so you get two. Do These Work As Well As Travel Agents? Yes these work as well as travel agents. Hi, I would use this adapter with TRP TTV RC Brake (on a cannoddalee slice rs), but if the adapater is too big, it won't fit on this brake. With is the size of this adapter? Which is the diameter of pulley? PS: I have already try this adapter , http://www.sjscycles.co.uk/problemsolverstravelagentbr031blackeachprod24613/?currency=eur but it is too big to fit. The diameter of the pulley is 25mm, its thickness is 3mm. i bought a set of these from you and cant seem to get them to work no intructions came though can you offer any advice ?? It is designed to replace the standard 90degree V-brake guide pipe which fits into the brake. 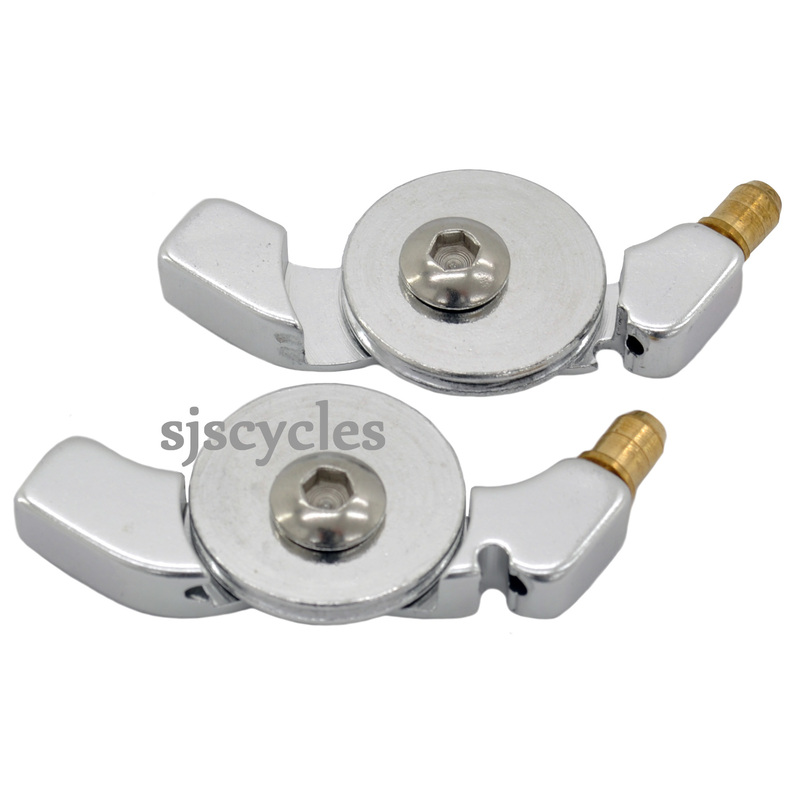 The gold end fits into the brake and the opposite end is designed to seat the ferrule from the outer cable. When the brake is in its "relaxed" position the smallest edge of the pulley wheel should be against the cable, so as the brake is pulled the cable gets pulled through and pulls the pulley wheel round into the larger position. This means that as the pulley wheel moves into the larger position it will pull more cable from the brake than is actually being pulled by the lever.